Whether he was painting on newspapers as a child or displaying his signature style in galleries across the globe, Romero Britto has always had the same goal. The internationally-renowned Pop artist talks about his rise to fame in this video from Park West Gallery. 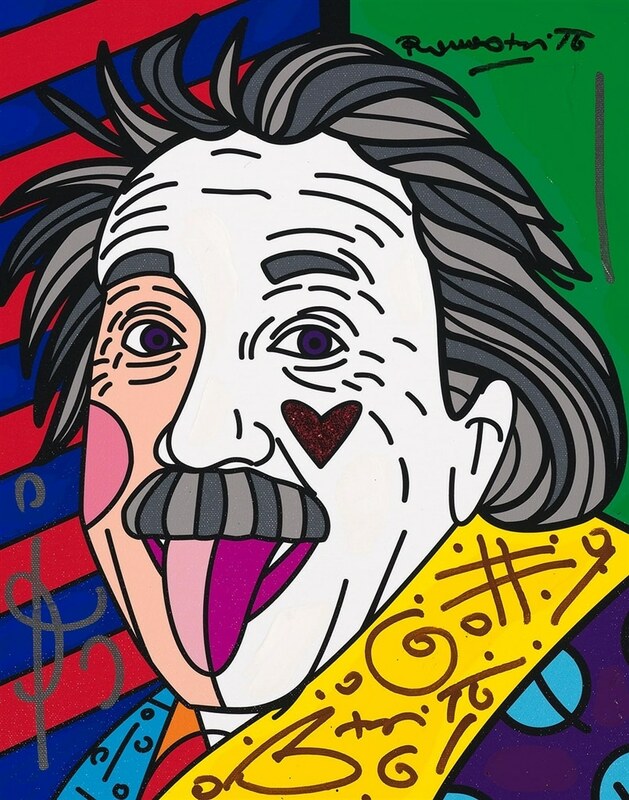 Known for his brightly-colored style that blends Pop Art and Cubism, Britto has become a global phenomenon—becoming one of the few living artists to truly bridge the gap between commercial success and critical acclaim. Britto has had 308 exhibitions and 63 public installations worldwide. His art appears in 24 museum collections and has been exhibited in the Carrousel du Louvre in Paris. His art and keen eye for design is also highly sought-after by some of the planet’s biggest brands. 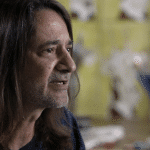 He’s been Disney, Coca-Cola, and other high-profile organizations, and has been the official artist for both the Super Bowl and the World Cup. Clearly, the world loves Britto. But Britto wasn’t always famous. One of nine children, he was born and raised in relative poverty in Recife, Brazil. He found inspiration from local artists and painted on every surface he could find. 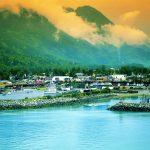 Eventually, a trip to Europe exposed him to artwork by Pablo Picasso and Henri Matisse, motivating him to become an artist. Britto immigrated to Miami in 1988, where he has resided ever since. His artwork gained international attention in 1989 while working with Absolut Vodka on a high-profile ad campaign. 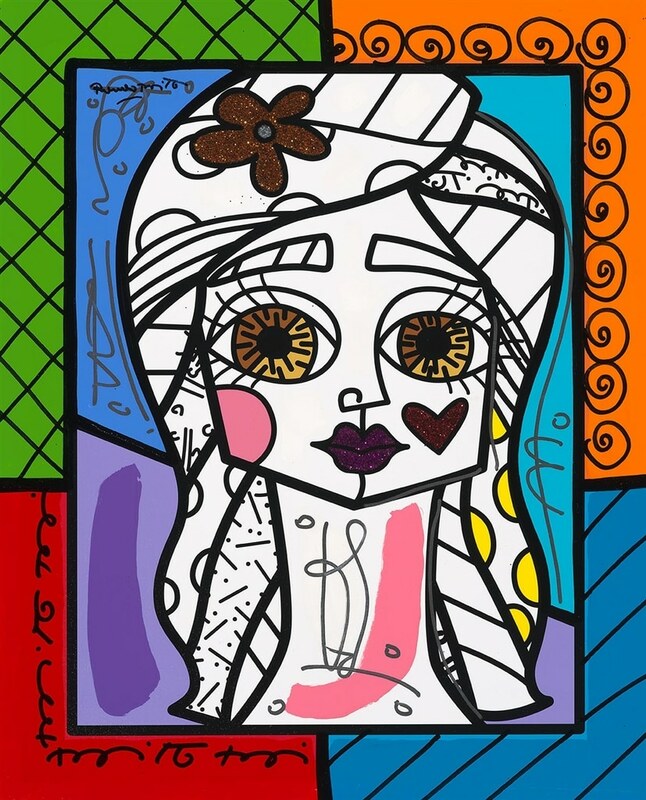 Since then, Britto has established himself as one of the world’s top Pop artists. In 2016, Britto returned to his home country to serve as Brazil’s ambassador for the Summer Olympics in Rio de Janeiro. Throughout the years, Britto has loaned his talent, energy, and time to more than 250 philanthropic causes, such as the Andre Agassi Foundation for Education, Best Buddies International, the World Economic and Development Fund, and St. Jude Children’s Research Hospital. He also founded the Britto Foundation, which supports humanitarian-based initiatives that benefit children around the world. 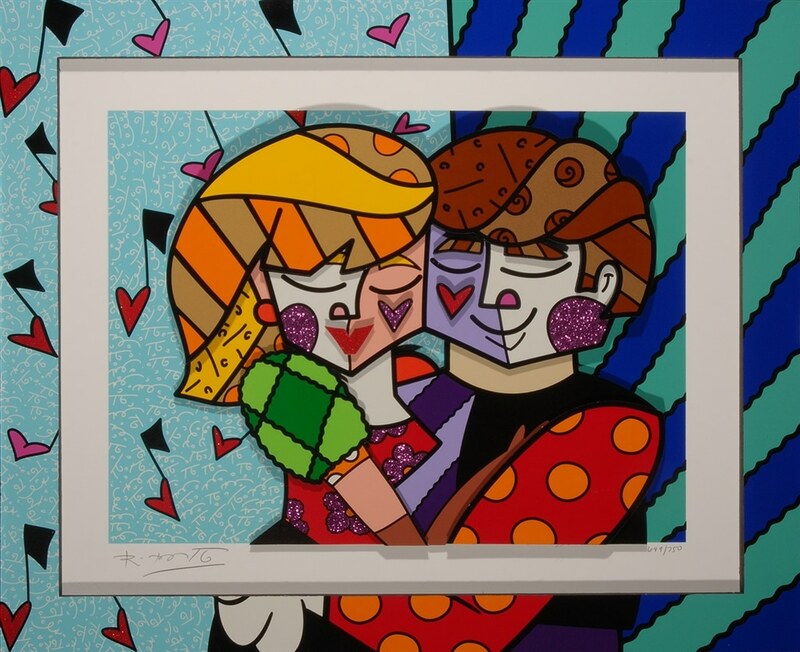 To collect art by Romero Britto, contact our gallery consultants during business hours at (800) 521-9654 ext. 4 or sales@parkwestgallery.com after hours. 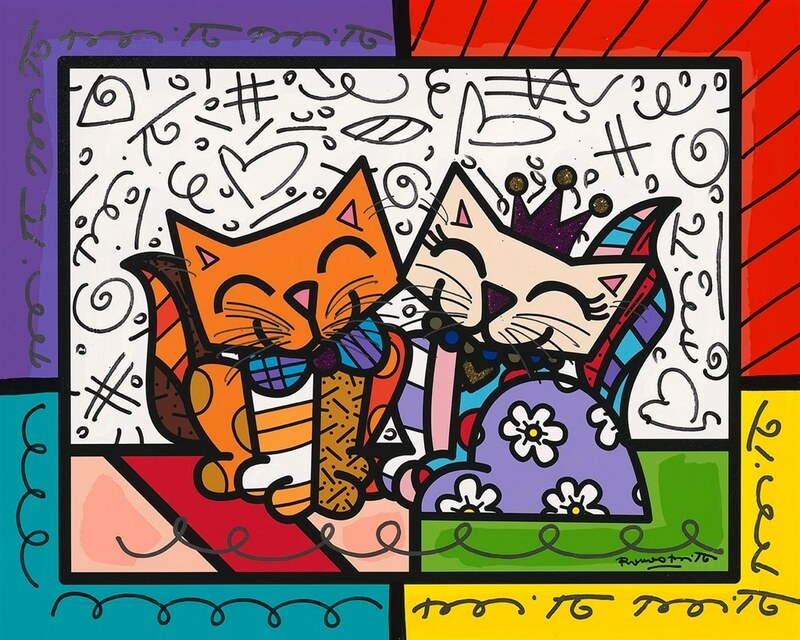 Became familiar with Romero Britto on the cruise ships……love his work, he’s a great inspiration for my art work! I love saturated, vibrant color. Britto’s work invigorates and makes me happy. I’ve collected 3 of his works… Deeply In Love, Deeply In Love Too, and Follow Me Please. I would love to see his work in colorful frames, pulling one color from his work to accentuate the art. 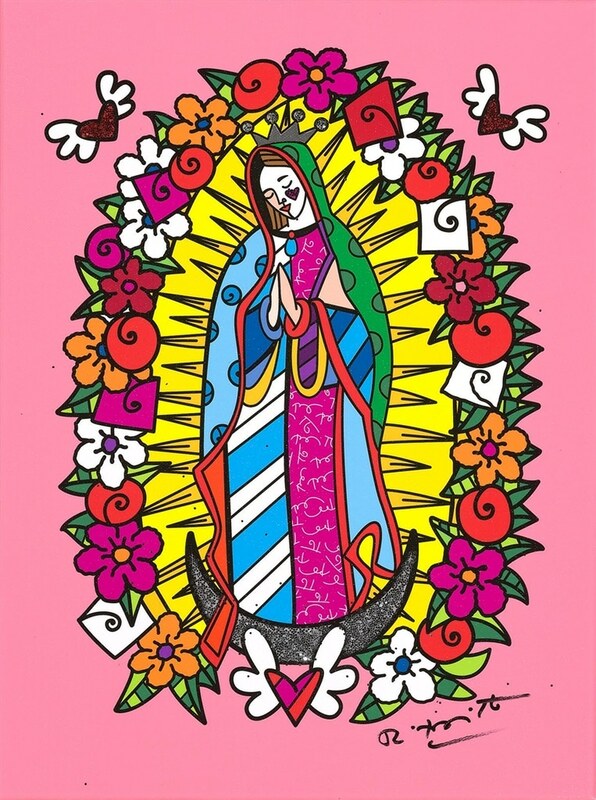 I love Britto’s work and look forward to collecting more of his works. I began my collection of Britto’s art on a recent cruise–I will continue to purchase more pieces, because as he states his own goal, they make me smile!! Really neat art. It reminds me of Roy Lichtenstein’s art, I really enjoy this style of art. First got to love your work on a cruise, which we bought Romeo on the beach, because it reminded me of our dog “snooks” that passed away. Love your work with Disney, so colourful and certainly makes me smile. Recently I saw your life size Romeo on a cruise. Love to purchase it on our next cruise, as it reminds me of our new dog “Elle”. Hopefully one day I will have the pleasure of meeting Britto to shake his hand and tell him how much pleasure and joy he has bought into my life. I really respect this man and admire his brilliant works of art. She just loves his work too. Does he ever have displays in various towns in the U.S.? If so I live in Arizona and would love to meet him. Just got back from a Princess Panama cruise and purchased our first piece “Forever”. We are really happy with it.